Psychedelic Font: How Wes Wilson Turned Hippie Era Turmoil Into Art It's been 50 years since artist Wes Wilson invented the psychedelic font that was popular in the '60 and '70s. Wilson talks about how he made a name for himself designing psychedelic concert posters. A Wes Wilson poster promoting the 13th Floor Elevators, Great Society, Sopwith Camel at the Fillmore Auditorium on August 26 and 27, 1966. It's been 50 years since artist Wes Wilson invented the psychedelic font that was popular in the '60 and '70s. Wilson, fueled by the war in Vietnam and social tensions throughout the country, turned turmoil into art. 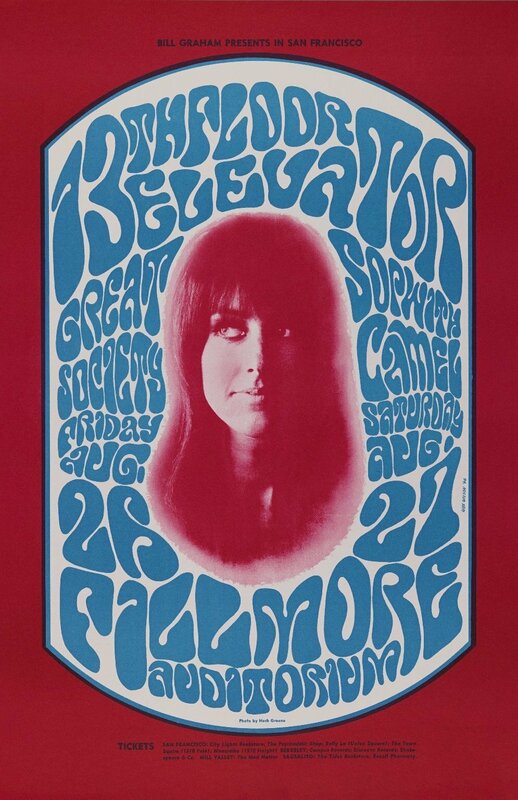 The colorful, balloon-shaped writing Wilson featured on posters for concerts in San Francisco helped define a time and place. "I think what inspired my art was a little bit of both music and the times, and basically, I wanted to do a poster that people liked to look at. And I wanted to use up all the space," Wilson tells NPR's Renee Montagne. "Once the color came into being then I was very inspired to try to put together colors that were really exciting — and the idea of using colors, complimentary colors right next to each other. And so it was kind of the combination of a whole bunch of things, and all based on this idealism of 'things are going to get better.' "